NASA's Kepler mission has taken its first images of the star-rich sky where it will soon begin hunting for planets like Earth. 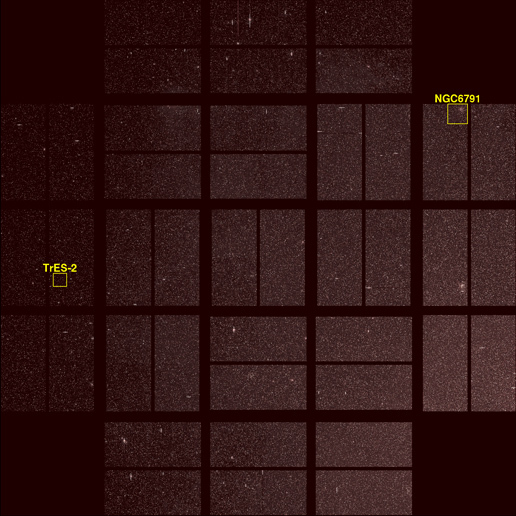 This image from NASA's Kepler mission shows the telescope's full field of view -- an expansive star-rich patch of sky in the constellations Cygnus and Lyra stretching across 100 square degrees, or the equivalent of two side-by-side dips of the Big Dipper. A cluster of stars, called NGC 6791, and a star with a known planet, called TrES-2, are outlined. The cluster is eight billion years old, and located 13,000 light-years from Earth. It is called an open cluster because its stars are loosely bound and have started to spread out. 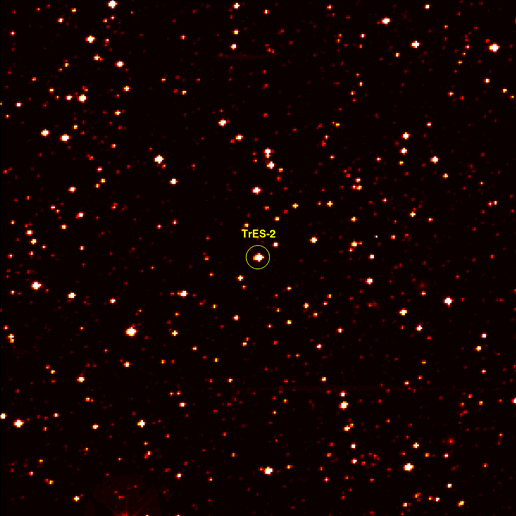 TrES-2 is a hot Jupiter-like planet known to cross in front of, or transit, its star every 2.5 days. Kepler will hunt for transiting planets that are as small as Earth. This image zooms into a small portion of Kepler's full field of view -- an expansive, 100-square-degree patch of sky in our Milky Way galaxy. At the center of the field is a star with a known "hot Jupiter" planet, named "TrES-2," zipping closely around it every 2.5 days. Kepler will observe TrES-2 and other known planets as a test to demonstrate that it is working properly, and to obtain new information about those planets. The area pictured is one-thousandth of Kepler's full field of view, and shows hundreds of stars at the very edge of the constellation Cygnus. The image has been color-coded so that brighter stars appear white, and fainter stars, red. It is a 60-second exposure, taken on April 8, 2009, one day after the spacecraft's dust cover was jettisoned.